On Tuesday, the University of Michigan College Republicans hosted conservative political pundit Charlie Kirk for a speech in the Michigan League. The talk centered around a discussion of ideological diversity and conservatism on college campuses, an especially salient issue as of late, following Central Student Government’s divestment debate last semester. 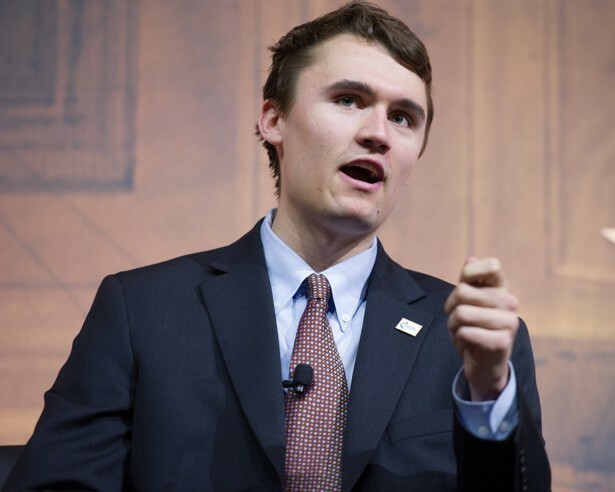 Charlie Kirk is the founder and CEO of Turning Point USA — a conservative organization dedicated to educating college students about the values of limited government and free market economics. Alongside student charters at over 300 campuses nationwide, the organization operates its own mobile news service — Turning Points News — similar in structure to left-wing competitor NowThis. They are arguably most famous for their “Professor Watchlist”, which maintains a public listing of professors accused of discriminating against conservative students or opinions. While student questions dominated most of the evening, Mr. Kirk began his speech by outlining the guiding principles of his organization. He argued that America is the greatest country in the world, the Constitution is the greatest political document ever written, and that free market capitalism is the best economic system for lifting people out of poverty. These central tenets, he stated, not only guide his work with Turning Point, but inform his entire political philosophy. From here, Mr. Kirk explained “Conservatarianism”, his personal philosophy which advocates for liberty of action so long as no harm is done to others. This rather Millian conception of liberty hinges on a critical assumption that people are inherently bad and imperfectible. As a result, while we can use institutions to better society, these actions are better conducted by private groups like churches or the family, rather than the government. Comments ranged from attacks of the BDS movement as one deserving of being “blocked (…) at every single turn”, to lengthy conversations on how best to address perceived liberal bias on campus. I had the opportunity to ask Mr. Kirk more about this aspect of his philosophy, especially considering the many failures and scandals plaguing such institutions over the years. He responded by noting that while we as a people can never be perfect, free market ethics help spawn new organizations out of corrupt ones — new churches out of old ones — that help improve private citizens’ actions better than government intervention ever could. To conclude the evening, Mr. Kirk passionately condemned socialism and recent upticks in “fake news”. He argued that socialism is “the greatest killer of this century”, and that young Democrats voting for socialist politicians are akin to “chickens voting for Colonel Sanders”. He was especially critical of coverage insinuating any negative opinions toward America or its role in the world, even claiming that without American intervention, South Korea would be unable to host this year’s Olympic games. Moreover, Mr. Kirk responded to recent reports comparing North Korean diplomat Kim Yo-jong favorably to Mike Pence: “The media hates Trump so much, they found a way to compliment North Korea”. Both Mr. Kirk and the audience seemed to enjoy the question-heavy latter portion of the evening. Comments ranged from attacks of the BDS movement as one deserving of being “blocked (…) at every single turn”, to lengthy conversations on how best to address perceived liberal bias on campus. One student in particular, a self proclaimed “neoliberal”, drew the ire of the crowd as he questioned the effectiveness of borders in preserving the free market. Mr. Kirk responded by defining “sovereignty”, as well as insinuating that an open-border policy is nothing more than a thinly-veiled no-border policy. At only 23 years old, Mr. Kirk has spoken to thousands of students across the country. His work has lead him to over 200 public appearances on Fox News and CNBC, becoming a prominent figure in advocating for limited government. You seem to be a smear type bigot. You hear nothing that has not been programmed into you by your handlers. Socialism was the venue of the Nation Socialist Workers Party aka Nazis. When Louis Farrakan came to speak at Detroit Comerica Park, the socialist governor, Granholm said nothing and endorsed the event. to wealth and property instead of responsibility and performance, and we are all determined to destroy this system under all conditions.” –Adolf Hitler, Berlin Opera House.